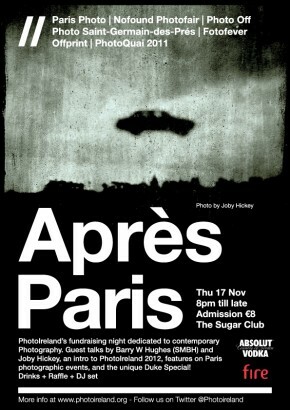 Après Paris: a night dedicated to contemporary Photography. You can’t make it to Paris Photo? Or won’t manage to see ALL the events that were on in Paris this November? Do not fret! PhotoIreland presents ‘Après Paris’, a fundraising night dedicated to contemporary Photography with a special feature on Paris’ photographic events this month. With highlights from Paris Photo, Nofound Photofair, Photo Off, Photo Saint-Germain-des-Prés, Fotofever, Offprint, PhotoQuai 2011, this will be a night to remember. The highlight of the evening will be Duke Special’s talk on ‘Under the Dark Cloth’, his recent collaboration at The Metropolitan Museum of Art (NY) to write all new songs inspired by photographs from the exhibition ‘Stieglitz, Steichen, Strand’. Duke Special is playing The Sugar Club two days earlier on the 15th Nov.
PhotoIreland is looking forward to seeing you all at The Sugar Club. Let’s celebrate & help support Ireland’s International Festival of Photography and Image Culture. Poster photo by Joby Hickey. Next PostMartin Parr's Best Books of the Decade: the list.